Looking for Stereo Microscopes? 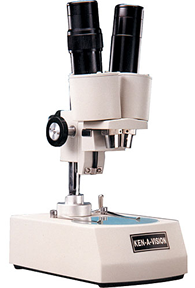 Low prices on Stereo microscopes Ken-A-Vision with free shipping. 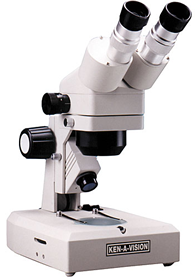 The worlds first inclined binocular stereo microscope designed specifically for students. This stereoscope is made of high impact resistant plastic and all glass optics for clean, crisp viewing. The Professor Stereo is available for purchase as a single unit or in packs of ten. 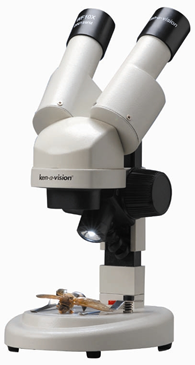 The Ken-A-Vision ESH200 Stereo Professor: it’s high-impact plastic construction makes it extremely durable. Features such as Ken-A-Vision's cool lighting system and a slip-clutch focus mechanism make "The Professor" the perfect springboard to a lifelong appreciation of scientific observation and discovery. • One-Piece Construction: The Professor's one piece plastic constructions makes it as safe as it is durable. The microscope is virtually "student-proof". • Indestructible Focus System: The slip clutch focus system is built to withstand the test of time while providing clear focus pulls every time. • Lightweight Design: The Professor's lightweight frame makes it exceptionally portable and easy to use. The Ken-A-Vision T-2400 is an affordable stereoscope ideal for introducing students of all ages to the research benefits of observing 3D objects up close. The T-2400 comes equipped with a fixed 2x objective lens as well as a 10x widefield binocular eyepiece with diopter. 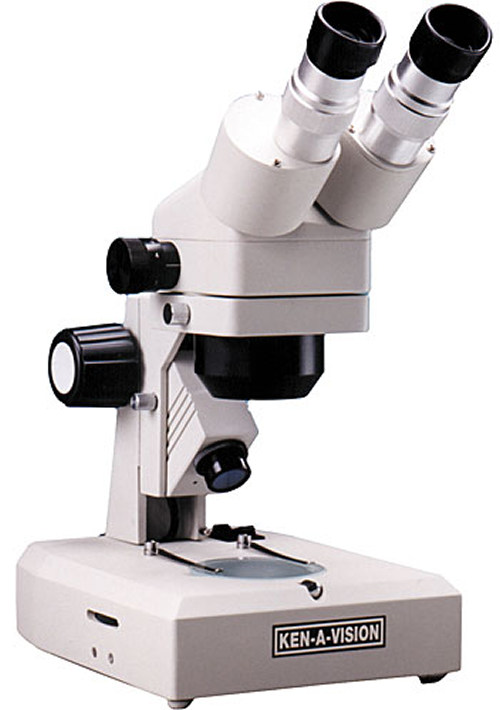 The T-2400 offers magnification capabilities at 20x. 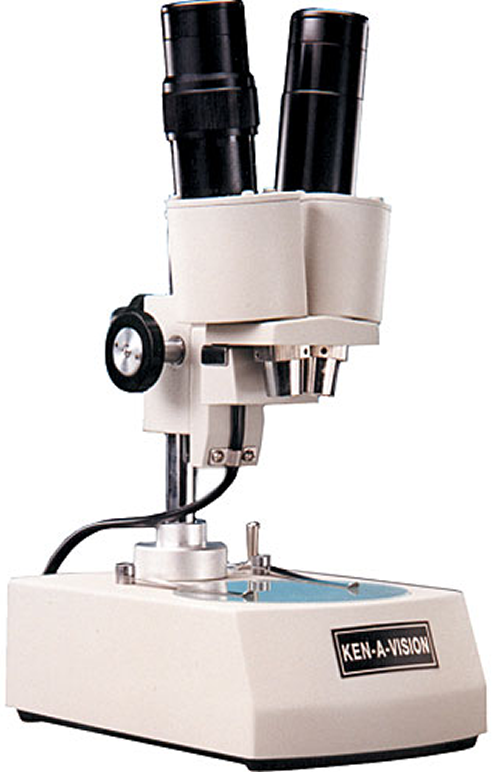 With a working distance of 80mm, you can easily examine largerocks, minerals, leaves, insects and other specimens. • Focus Made Easy: Focusing with the Vision Scope couldn't be easier. The focus knob ensures an accurate focus pull every time. 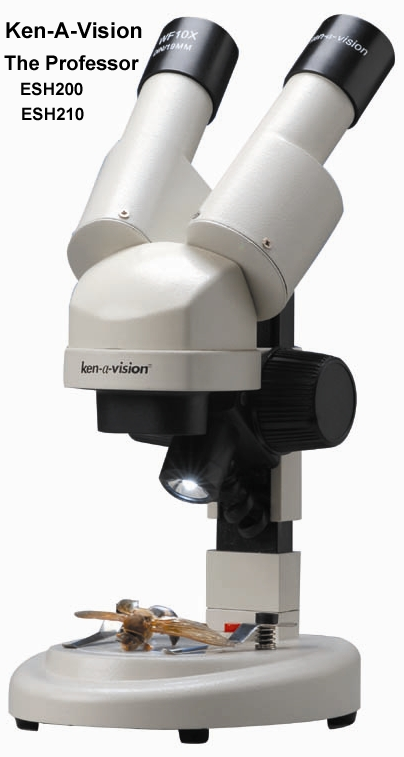 The Ken-A-Vision T-2400C is an affordable stereoscope ideal for introducing students of all ages to the research benefits of observing 3D objects up close. Being completely cordless, this model can be moved around freely by the use of a NiMH high-powered battery. The T-2400C comes equipped with a fixed 2x objective lens as well as a 10x widefield binocular eyepiece with diopter. This is a cordless model with a rechargeable illumination system. Ideal for setting up work stations and for the traveling hobbyist. Focus Made Easy: Focusing with the Vision Scope couldn't be easier. The focus knob ensures an accurate focus pull every time. This uniquely designed stereoscopes provide a rubber base for stability and protection. clear stereoscopic (3-D) images. These stereomicroscopes are value-priced to meet mostbudgets. • 3-way transmitted light Use top, bottom, or both lights at the same time. • Light Source Upper and Lower - Fluorescent transmitted light below and variable Halogen incident light above. • Modular Design: The Vision Scope makes it easy to swap in and out various levels of magnification, from 1x to 60x. • 360° of Freedom: The scope's viewfinder can be spun 360° around with no trouble. This can be very useful in labs where multiple people need to observe the same specimen. • Dimmer Control: Varying level of illumination on your subject is made simple by using the built-in light dimmer controller. • Focus Made Easy: Focusing with the Vision Scope couldn't be easier. The oversized focus knob ensures an accurate focus pull every time.